I like being in the kitchen but only as long as I am pulling together something easy and delicious that I KNOW THE KIDS WILL EAT! But that’s not how this day started. That day I was wondering how to feed my kids something wholesome that would also ward off their scratchy colds (and mine!). 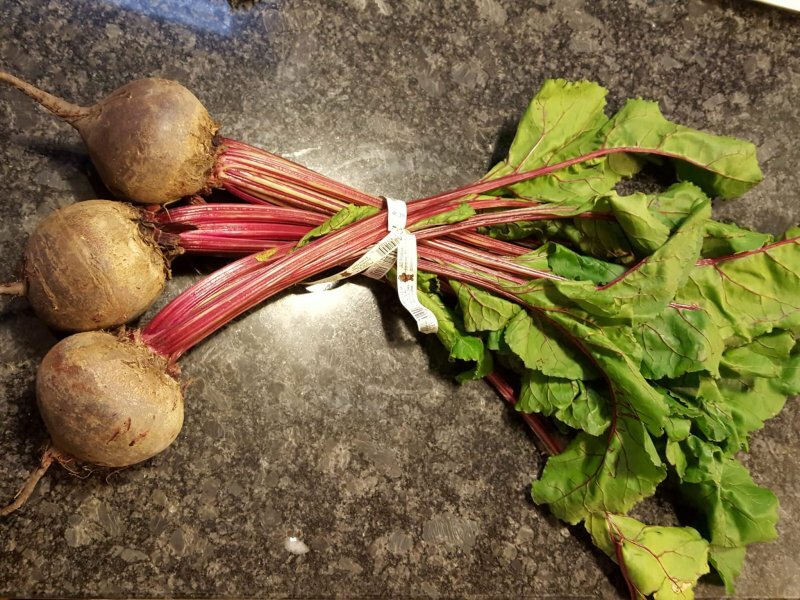 And I may never say this again but that day beets – delicious beets – were the answer. Beets are a health powerhouse. They have proven effective in increasing stamina, reducing inflammation, and appropriate for this holiday season, a great detoxification agent. With the addition of onion and ginger in this beet soup, we end up with a flu-fighting AND delicious remedy that will blow those winter blues away. If you follow my writing (thank you!) you know I like to make kitchen time easy. This beet and ginger soup is a snap to make. The vegetables can cook while you’re helping kids with the homework or checking your email. 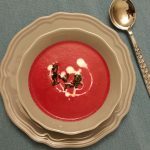 And even if you don’t give any credence to the liver-cleansing, immunity boosting properties of the ingredients of this soup, it doesn’t matter; this beet soup is just plain old delicious. 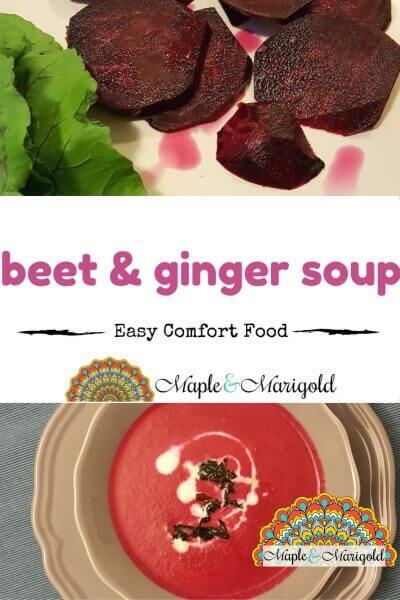 Cook the beets, ginger and onion, blend and spoon, this soup is yummy at room temperature or steaming hot. I serve it with a side of sautéd beet greens. Yes, BEET greens! 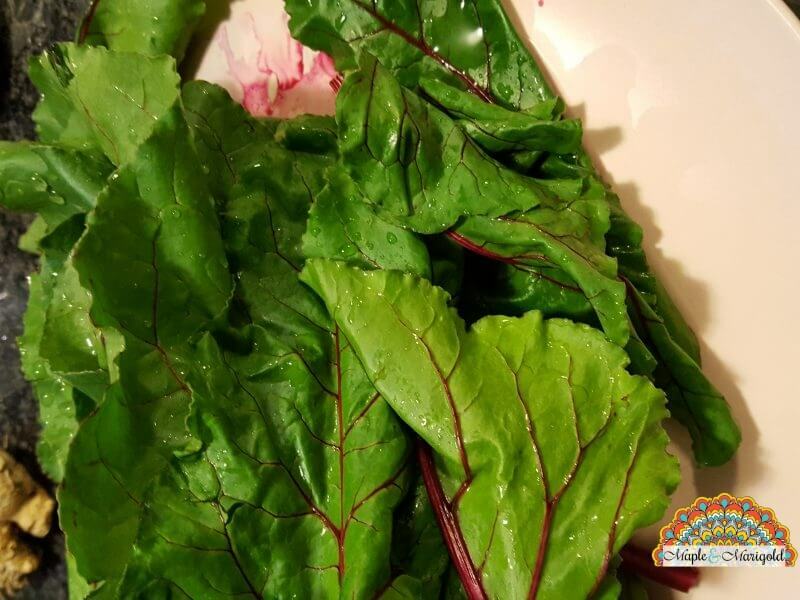 A big part of the vegetable, beet greens are usually discarded. But they are full of flavour and rich in nutrition that boosts immunity and bone strength. A quick sauté with garlic and spices, and beet greens make a perfect topping for the beet soup. 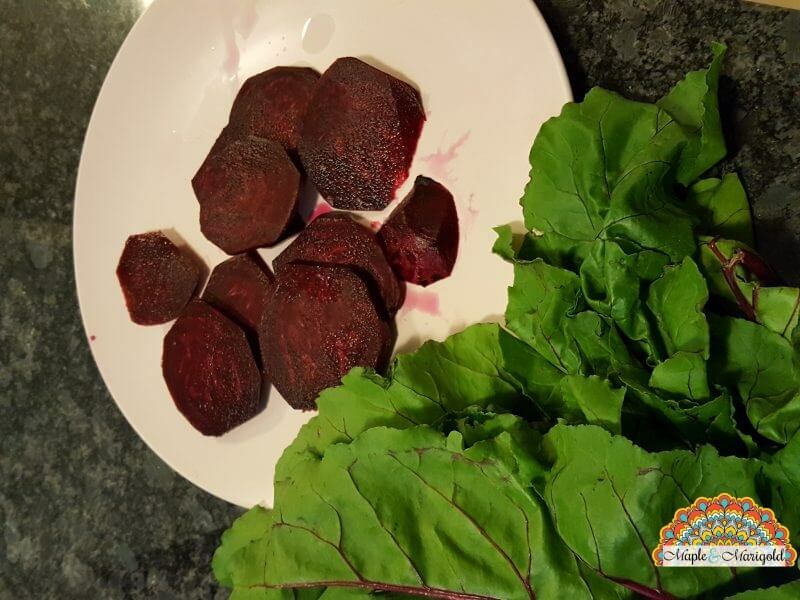 Use a smooth chopping surface to chop the beets otherwise you’ll be washing the pink off for a long time. I use canola oil for the soup and greens. 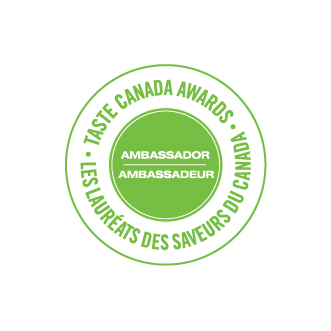 It has a very mild flavour of it’s own that lets the vegetables shine through. Cut the tops off the beets and wash, and wash again. Trim the beet greens and leave only the tender part of the stem. Chop. In the past I’ve served beet soup with crispy brussels sprouts as well. Works very well! Peel beets and cut into chunks. Take a tbsp of oil in a pan on medium heat. Pour in the liquid. 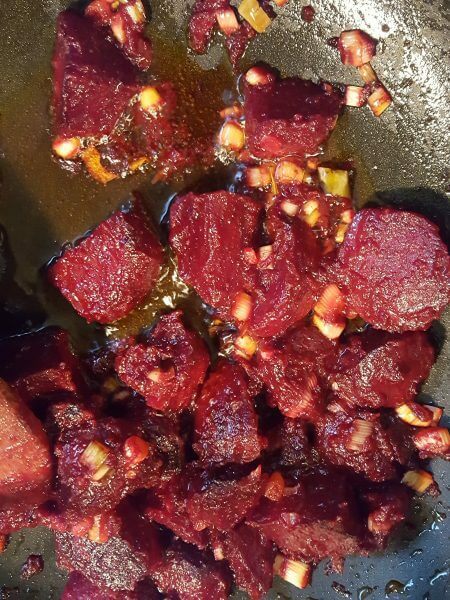 Boil once and then simmer for 20-30 minutes, till the beets are soft. Serve with a splash of cream. Take 3 chopped garlic cloves in a tbsp oil along with a sprinkle of red chilli peppers. I go a little crazy with chilli peppers here since it is unlikely my kids will eat this. Sauté for a few minutes till the garlic turns a little brown. Great recipe! I’ll use it next time I feel sick! I love beets! Plus ginger i find it really interesting! A recipe I must try soon, especially after all the holiday sinning i did… thanks for sharing! Love the festive colour of this soup! Perfect any time, of course. Hope you feel better soon. I love that this soup is so easy to make. I’m definitely Pinning it to try! 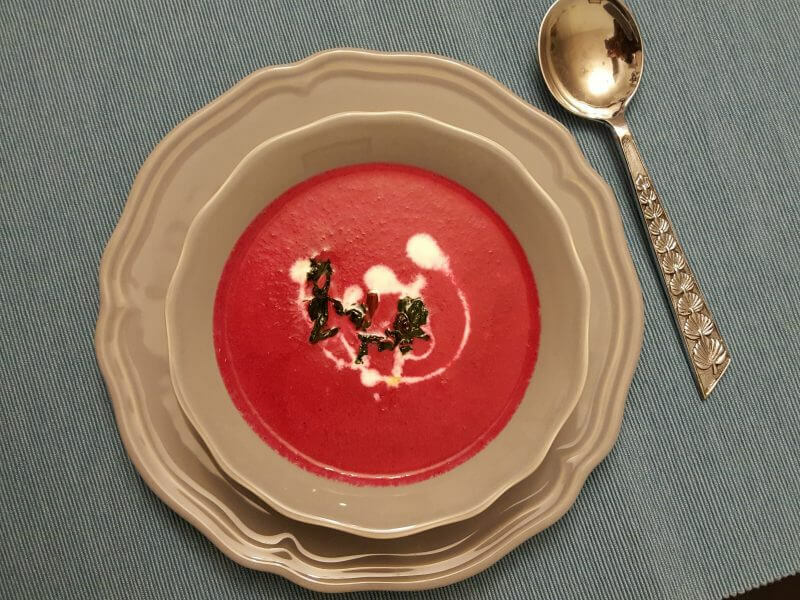 i have beets that needs to be used – definitely going to try this soup! Let me know how it turns out. I’m making it tonight as well! I made this today. It’s lovely with the apple cider! I also like that it’s so easy to make!